Who doesn't love both the look and taste of a Fruit Tart? Unfortunately the classic recipe can be a little time consuming, so I decided to make what I call an "Easy" Fruit Tart. A simpler version, perfect for weekdays when time is at a minimum. This Easy Fruit Tart is made with a very simple shortbread crust and the filling is just a beaten mixture of heavy cream and mascarpone cheese. It is so simple yet so good. Of course, the crowning touch to any fruit tart is the fruit, and while you can arrange the fruit in concentric circles, to make things "easy" I have just piled the fruit randomly on top of the cream. This Easy Fruit Tart begins with a pre-baked shortbread crust which does, in fact, taste like a shortbread cookie. It is so easy to prepare. Just give the ingredients a quick whirl in your food processor until you see a dough beginning to form. Then press the dough into your tart pan, prick the bottom of the pastry, and place the pan in the freezer for about 15 minutes. Bake the crust until golden brown and let it cool completely. You can even make the crust a day or two before filling. While the classic filling for fruit tarts may be a pastry cream, I decided to use an uncooked filling made simply by whipping together mascarpone cheese and cold heavy cream (double cream) (cream with a 35-40% butterfat content). It is lovely, so velvety smooth and creamy with just a hint of sweetness and vanilla flavor. For those who are unfamiliar with Mascarpone cheese it is a soft unripened cheese that belongs to the cream cheese family. It comes from Switzerland and Italy and is a thick, buttery-rich, sweet and velvety, ivory-colored cheese produced from cow's milk that has the texture of sour cream. It is sold in plastic eight ounce tubs and can be found in specialty food stores and in the deli section of some grocery stores. However, if you cannot find it, just substitute regular cream cheese for the mascarpone. Now, once the filling is spread onto the baked pastry shell, we then garnish the tart with fresh fruit. While I have used fresh berries, you could use slices of kiwi, pineapple, banana, melon, plums, mango, nectarines, or peaches. If you serve this tart the day it is assembled, the tart shell will be crisp. However, if you store it overnight the crust does soften. Excellent either way. Place the tart pan on a larger baking sheet and bake until the crust is golden brown, about 13 - 15 minutes. Remove from oven and place on a wire rack to cool. Can be covered and stored for a few days. Cream Filling: In the bowl of your electric mixer (or with a hand mixer or wire whisk) beat the mascarpone cheese, heavy whipping cream, sugar and vanilla extract just until soft peaks form. If too thick to spread, beat in a little more heavy cream. 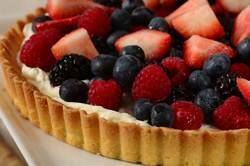 To Assemble Tart: Evenly spread the cream onto the baked and cooled tart shell. Scatter the berries on top of the cream. If not serving immediately, refrigerate. Remove from fridge about 30 minutes before serving to give the fruit and cream a chance to warm to room temperature.